Chicken and dumplings, made with a stewed chicken and homemade dumplings, is one of the South's best-loved dishes. Pat the chicken with paper towels to dry and cut it into pieces. Place the chicken parts in a Dutch oven or large kettle; add water and 1 teaspoon salt. Bring to a boil; cover, reduce heat and simmer for about 1 1/2 hours, or until tender. Remove chicken and set aside to cool slightly. 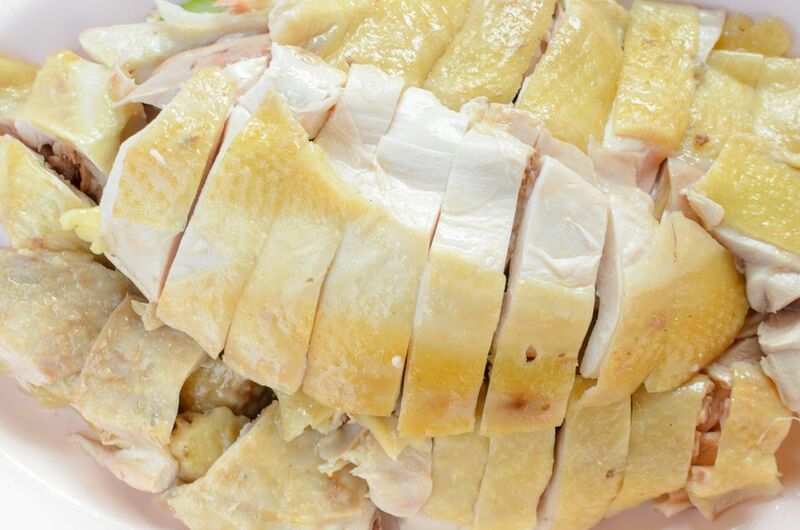 When it's cool enough to handle, debone the chicken and cut the meat into bite-size pieces; set aside. Bring the remaining broth to a boil; add the black pepper. In a bowl, combine the flour, baking soda, and the remaining 1/2 teaspoon salt; cut in shortening until mixture resembles coarse meal. Add buttermilk, stirring with a fork until dry ingredients are moistened. Turn dough out onto a well-floured surface, and knead lightly 4 or 5 times. Roll the dough to make the dumplings a 1/4-inch thick. Cut dough into 4 x 1/2-inch pieces. Drop the dough, one piece at a time, into the boiling broth, carefully stirring after each addition. Reduce heat to medium-low, and cook 8 to 10 minutes or until you reach your desired thickness, stirring occasionally. Add the chicken back to the broth and stir gently.